Free samples at Costco are one of our God-given rights as Americans, but that doesn't mean getting that sample is going to come easily. Two elderly men learned this lesson all too well on July 26, when a dispute in the line for free samples led to the boxing of ears and possibly some old-timey insults. According to South Carolina newspaper The State, a 72-year-old man allegedly hit a 70-year-old man in Greenville, South Carolina, knocking off both his hat and glasses over an accusation of line-cutting. The younger of the septuagenarians claims that the man two years his senior (who was also wearing a Hawaiian shirt, which feels relevant) cut him in line and helped himself to a free cheese sample before it was his turn. When the two found themselves in line together yet again (this time for cheeseburger samples), the 70-year-old man told the 72-year-old man to go on ahead of him "because he knew he would cut the line anyway." The other man said he would do it again. The grumpiest fistfight of all time ensued. 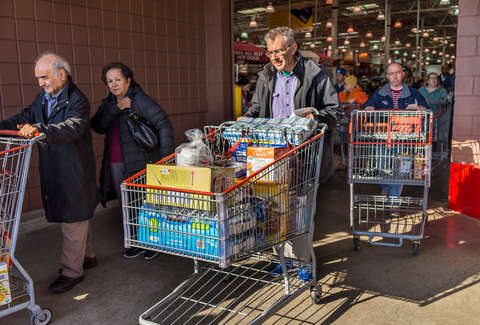 The Takeout reports that by the time the police arrived, the man wearing the Hawaiian shirt had left, but they tracked him down, and he confessed that he was involved in an "altercation" at a Costco (which, who among us?). Police are investigating surveillance footage. Thus far no arrests have been made.